Bula! Welcome to the Beautiful Fiji Islands! English is the official language of Fiji and most people in Fiji speak English fluently, but the Fijians are essentially bilingual and speak their own language in many different dialects. English as spoken in Fiji contains many Fijian words and phrases. A few tweaks in phonetics and you can pick them up easily, thanks to the similarity in pronunciation between the two languages. Not only will it be useful, but it will also delight the Fijians that you have made the effort! Fiji functions on an electrical current of 240 volts 50 hertz. As in Australia and New Zealand, the power outlets are three pin. Most hotels and resorts offer power outlets that support both 240 volts and 110 volts for electric shavers and dryers. If you do not find one, use a voltage converter for appliances that are of 110 volts. Most hotels have direct dialling facilities. The international country code to dial into Fiji is 679. There are no area codes. To dial internationally out of Fiji, dial 05, followed by the relevant country code and phone number. To dial fire or ambulance in Fiji, the emergency number is 911. To dial police stations directly, dial 917. Vodafone Fiji provides a GSM digital mobile communication service and has global roaming arrangements. If you have arranged roaming with your service provider before leaving home, Vodafone will give you an excellent coverage in most locations in Fiji. There is a Vodafone Rental office located at the Nadi International Airport where you can obtain a connection with local number either using your own GSM phone or by renting a phone. Card phones are also available in urban centres and phone cards of various amounts can be bought from post offices, service stations and many shops. Connect Internet Services is the Internet Service Provider (ISP) in Fiji offering a wide range of products and services for the consumer and business markets including dial-up access, broadband service, dedicated high-speed solutions, hosting, and Internet application development. Connect Fiji offers a Global Roaming access to visitors through an agreement with GRIC. Internet cafes can be found in Suva, Nadi and Lautoka. In other areas, it may be harder to find. They are usually open from early to late. Costs are approximately US$3 an hour. 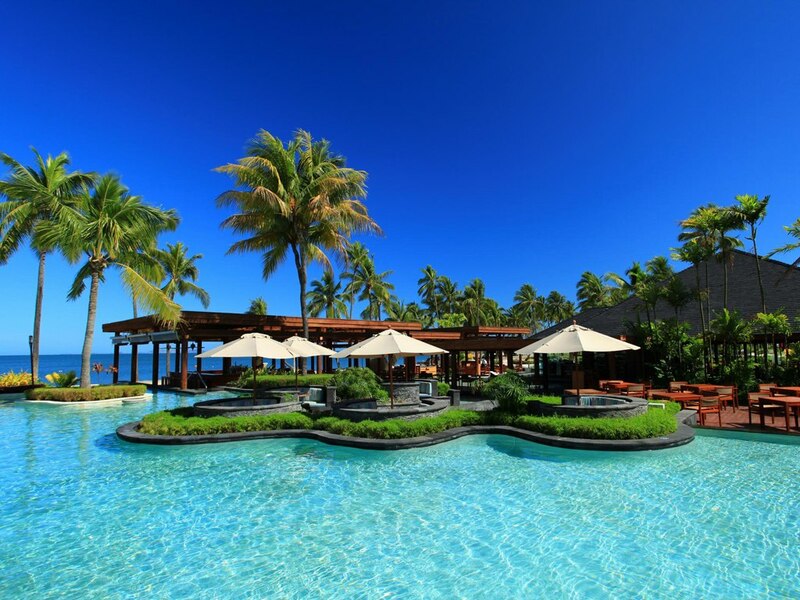 Fiji enjoys an ideal South Seas tropical climate. It is thus a perfect holiday destination, especially for those trying to escape the severe Northern Hemisphere winters. Maximum summer temperatures average 31 degrees Celsius (88 degrees Fahrenheit) and the minimum is 22 Degrees Celsius (72 degrees Fahrenheit). from the east south east for most of the year. It usually drops to a whisper in the evening and picks up again by mid morning. Fiji has a climate ideally suited for the outdoors, the beach and surf, water sports and relaxing! ought in, and you can take out an amount equivalent to what you have brought in. The unit of currency in Fiji is the Fijian Dollar. Notes are available in denominations of $2, $5, $10, $20, $50 and $100. Coins are available in denominations of 5c, 20c, 50c and $1. Most of the travel agents, hotels, restaurants, shops, tours and cruise operators, and car rental agencies accept all major credit cards. In Suva, Diners Club, MasterCard, Visa, and JCB International have established offices to help tourists. Major international banks like ANZ Bank, Habib Bank, Bank of Baroda, Colonial Bank and Westpac operate in Fiji. Banks operate every morning from 9.30 to 3.00 in the evening from Monday to Thursday and up to 4 pm on Friday. If you need a bank on Saturday, then step into the Colonial Bank, which is open for half a day. ANZ Bank has a day and night counter at the Nadi International Airport Arrival Lounge for the convenience of the tourists. ATMs are placed strategically at various points in the towns and cities and in bigger resorts. Sending mail abroad from Fiji can take anywhere up 10-12 days to reach destinations such as Europe. The post offices usually operate from 8.00am-4.30pm and until 12pm on Saturdays. The Fiji Islands are known as the hub of the South Pacific, where the two main ethnic groups meet, making Fiji a truly unique country. To the east are Tonga and the other islands of Polynesia. To the west is Vanuatu, and the island countries that make up Melanesia. Fiji comprises of several different races and people, with native Fijians and the descendants of indentured Indian labourers brought to the islands to work in the plantations and sugar cane fields dominating the population. Our Fiji travel guide below will tell you all you need to know about the best of beautiful Fiji. If you are more interested in the local highlights, the best way to see them and experience the local culture is to take a fiji tour. Fiji Hotels brings you a step closer to Fiji by providing this useful information for all visitors. Dentist in Fairfax dentists in Fairfax.